The DPP won a smashing victory over the KMT two weeks ago. If those results are duplicated in the legislative elections coming up in a mere 13 months, the DPP will take firm control of the legislature. Of course, you can’t assume that the mayoral vote will be replicated. For one thing, all those national issues (ie: 92 Consensus) that largely stayed off the agenda will be unavoidable in 2016. For another, the candidates will be different. The KMT will be fielding a roster of quality incumbents while the DPP will have a higher share of unproven challengers. Still, these results should scare the pants off of some incumbent KMT legislators. In this post, I’m going to look at who should be the most terrified. In 2012, the DPP won 40 seats and the TSU took 3, so the green camp needs another 14 seats to win a majority. They probably shouldn’t count on keeping the Taitung seat, since the KMT vote might not be split next time. So let’s see how likely it is that the DPP can win 15 more seats. Legislators will be ranked from one to four, with four exclamation marks being the most alarmed. Lin Kuo-cheng holds the Kaohsiung 9 seat because Chen Shui-bian’s son split the DPP vote. This district is so solidly green that the DPP might take it back even if they split the vote again. Weng Chong-chun and Chang Chia-chun won improbable victories in 2012. If this election is any indication, they won’t be able to repeat that feat in 2016. In 2014, Weng ran personally and Chang’s aunt ran in Yunlin. Both were resoundingly thumped in their own legislative district. Chang’s father has already announced the family won’t be running for re-election. I expect Weng will give it a try, but he is trying to run up an ever steeper hill. At least he should be facing a weaker opponent. Wang Chin-shih has somehow managed to retain his seat for two terms. This is not an overwhelming DPP district like the previous three, but it was already green in 2012 and will probably tilt even greener by 2016. The KMT had a competent candidate in Pingtung, but he could barely manage 40% in this district. Wang should be terrified. Huang Chao-shun is the only KMT legislator in the south with a reasonable shot at keeping her seat. This district went roughly as green as the entire country in 2012, which was not enough to win the presidency or this seat. However, Huang should probably be alarmed by the unfathomable 63.7% Chen Chu won in this district. Chen won such an enormous victory that it is hard to imagine how it will translate to the next election. Some of those people will certainly go back to the KMT, but some probably will not. Huang needs an awful lot of people to return to the KMT fold in 2016. The DPP won a higher vote share in Nantou 1 this year, but Nantou 2 has always been the better target for them. Nantou 1 has an entrenched incumbent, and Puli is famous for rallying around native candidates. Nantou 2, however, is now an open seat, and without Lin Ming-chen 林明溱 to hold down the fort, it should ripe for the picking. The DPP needs to win this sort of district, in which Tsai Ing-wen got 44% or more, if they are to win an overall majority. Fortunately for them, they will get a shot to win the seat in a by-election, where conditions tend to favor the DPP. Assuming the DPP wins Nantou 2 now, it will have an incumbent defending the seat in 2016 and might be hard to dislodge. In Changhua, the KMT has three seats, and the Changhua 4 seat has now become open. In the presidential election, Changhua 4 was not the DPP’s best district. Rather, Tsai was slightly stronger in both Changhua 1 and Changhua 3. The KMT incumbents in both of those districts should be extremely concerned. Changhua 2 might be a little different. This has always been a more blue-leaning district, and Lin Tsang-min will be defending his seat. On the other hand, Lin lost his home district in 2014, so he can’t be too confident. My guess is that, if you strip away all the influences of individual candidates, districts 1, 3, and 4 are currently leaning toward the DPP with district 2 just about a tossup. However, candidates matter a lot in places like Changhua, and the KMT will be fielding three incumbents. The DPP might beat them, but they won’t go down without a vigorous fight. There are eight districts in Taichung which can roughly be divided into two groups. Districts 1, 2, 3, 6, 7, and 8 were all fairly close in both 2012 and 2014. Tsai won about 46% and Lin Chia-lung got about 58% in all of them. The DPP currently holds three of these seats (1, 6, and 7), and it should vigorously contest the other three. The District 8 incumbent, Chiang Chi-chen, seems the most likely to fall, as there have been rumblings that the local factions have not been happy with him. In District 3, Yang Chiung-ying has been in the legislature since 1998, and she was in the provincial assembly for a couple of terms before that. She has very deep connections running throughout the district. However, precisely because she is so deeply entrenched in clientelistic politics, she might be vulnerable to the same sort of wave that drowned Sean Lien and John Wu this year. In District 2, the Yen family seems to be dug in. They managed to transfer the seat from the father to the son in a by-election last year even though by-elections in this political climate tend to overwhelmingly favor the DPP. In a general election, the DPP will have an even harder time overcoming the unique appeal of the Yen family. To unseat them, the 2016 presidential candidate might need to replicate Lin’s 58.6% performance in this district. In both 2008 and 2012, the DPP has utterly failed to challenge Yang or Yen. If they are serious about these seats, they have to find more capable candidates than the cannon fodder they have previously presented to the electorate. It might be that the top quality candidates were scared off because the races looked nearly impossible. That should not be as much of a barrier in 2016. The other two Taichung districts are much bluer. Lin won Districts 4 and 5 with about 53%, while in 2012 Tsai could only manage about 41%. These are the richest parts of the city, and they also have a higher proportion of Mainlanders than any other district. Even assuming the current anti-KMT wave is most intense in the most urbanized areas, I don’t expect the DPP to be able to take District 5 from Lu Hsiu-yen. Tsai Chin-lung in District 4 looks much weaker. He only won re-election in 2012 by a 54-46 margin, and he will probably face the same strong opponent (Chang Liao Wan-chien 張廖萬堅) again in 2016. KMT legislators from New Taipei have to look at the 2014 results differently than their colleagues from other cities or counties. In New Taipei, the pre-election consensus was that the KMT had an extremely popular candidate running against a lackluster DPP candidate. Eric Chu, with all of his personal popularity, barely survived this election. In places like Kaohsiung or Taichung, it is unlikely that the DPP can replicate such impressive numbers in future elections. In New Taipei, after stripping away the 2014 candidates’ personal influences, the DPP vote shares might actually be too low. Every KMT legislator has to ask him or herself, “Am I as good as Chu and will my opponent be as lousy as You?” The answers aren’t encouraging for the KMT in 2016. Districts 8, 9, and 11 are safe KMT districts. In 2014, these three districts won the election for Chu. The Xindian Luo family’s seat is far safer than the Yunlin Chang family’s or the Taichung Yen family’s seat. (Quick quiz: What is the common thread tying those three families together?) In Zhonghe, Chang Ching-chung will go down (as a footnote) in history for triggering the Sunflower movement. However, the Sunflowers and their supporters would be wise to direct their energies elsewhere, since the New Taipei 8 seat is unwinnable. KMT supporters might not want to be too happy about having these three safe seats. One of the classic gerrymandering strategies is to pack all of your opponent’s strongest neighborhoods into one district. Assuming the overall balance of power is roughly even, by sacrificing that single district, you can win by a small margin in all the other districts. New Taipei City is a natural DPP gerrymander. If the DPP can get to 50% overall, it will win more than half of the seats. In 2014, even though the KMT won New Taipei by 1.3%, the DPP won 7 of the 12 legislative districts. Districts 1 and 12 are the other two that Chu won a majority in. In previous elections, these have usually been solidly blue. In 2014 Chu won by a surprisingly small margin, especially in District 12, which is mostly Xizhi. This should serve as a wake-up call to Wu Yu-sheng and Lee Ching-hua. They should probably still be able to win, but it is by no means an automatic victory. After 22 years in the legislature, if Lee doesn’t still have the energy to fend off a serious challenge, this might be a good time for him to triumphantly retire. Districts 7 and 10 are similar and are right on the border between two and three exclamation marks. They are also adjacent to each other, since Tucheng (D10) abuts the southwestern part of Banqiao (D7). These are also just about the median districts nationally, in that one of them might be the 57th seat for one of the parties. Both of these incumbents are fairly anonymous nationally but have spent a lot of time working the district. Districts 4, 5, and 6 are the most likely dominos to fall. District 6 (northeast Banqiao) will be particularly interesting. A year and a half ago, Lin Hung-chih might have been my choice as the most likely KMT nominee for New Taipei mayor in 2018. However, the last year and a half have not been good for him. He was the KMT whip during the September Struggle and the Sunflower movement. He did much of Ma’s dirty work in the legislature, and Ma tried to use him to bypass Speaker Wang. After resigning the whip position, Lin complained that he had not wanted to do these things but he was obliged to do what the party demanded. Nonetheless, the DPP will almost certainly try to paint him as Ma’s puppet and ask voters to reject Ma. In past elections, Lin’s personal popularity has masked the fact that his district is by no means solidly blue. In 2016, he should be terrified that his willingness to follow Ma’s orders might cost him what looked like a promising political career. This glance at Taoyuan is a reminder of just how unlikely Cheng Wen-tsan’s mayoral victory was. He built his winning coalition on a very weak DPP foundation. One of the most important questions for Taiwan’s future is whether the 2014 election was a one-time freakish event based on the personal failings of John Wu or whether these results reflect real underlying changes in the electorate and can be replicated in the future. My hunch is that future elections will look more like 2012 than 2014, but, as the wag quipped, predictions are always shaky – especially the ones about the future. In the past, District 2 (coast) has been the DPP’s best by far. In fact, this looked like the only one that the DPP had a realistic shot at. What was interesting about this election was that the DPP’s vote exploded in Districts 1 and 4, the mostly Min-nan areas closest to New Taipei City. In 2012, the KMT incumbent crushed his DPP opponent by over 10%. In 2014, Cheng won D1 by 12%. The strange thing is that the DPP’s candidate in 2012 was none other than Cheng Wen-tsan. If I were Chen Ken-te or Yang Li-huan, I would be shocked and very, very concerned. I would certainly do everything possible to distance myself from the Wu family and President Ma. I would also be talking to as many of my constituents as possible to try to figure out what happened. As much as anywhere in the country, these two seats are ground zero for the wave that just swept over Taiwan. If that wave hasn’t receded by early 2016, these two could be in trouble. District 6 is a bit like New Taipei 1 and 12. This is a district that I have always considered to be an absolutely safe blue seat, yet the DPP came startlingly close to winning it in 2014. District 6 actually has three distinct parts. Daxi is an older area with far less industry, and its population hasn’t grown as fast as the rest of Taoyuan. In past years, this has been the DPP’s strongest part of the district. Most of the electorate resides in Bade. Bade is somewhat like the fast growing Min-nan areas in Districts 1 and 4, although Bade has always favored the KMT more strongly than either of those two areas. Finally, there are also about 25000 votes from Zhongli. While this is the smallest of the three pieces, it is also the most extreme. These areas of Zhongli are mostly military communities, and they have, in the past, gone for the KMT by as much as 80-20. When I studied the redistricting process from the perspective of the 2004 election, District 6 was the safest of all the Taoyuan districts. In fact, the DPP put the Zhongli military votes with Bade precisely because they thought they had a better chance of winning the remaining (mostly Hakka) areas of Zhongli than winning in Bade. In 2014, Cheng shockingly won Bade by 2%. Wu only won District 6 because of his margin in the Zhongli military areas and the mostly Aboriginal Fuxing district. (I ignored Fuxing since Aborigines vote in separate legislative districts.) Because of the safety net provided by the Zhongli military votes, Sun Ta-chien is unlikely to lose in 2016. Still, he should be jolted by the realization that his district has suddenly become competitive. I am not going to bother with Taipei City. Ko and Lien had such a strong personal influence on the race that I’m not sure it can tell us much about how voters will decide in 2016. The DPP has to win 15 more seats. I have marked 14 seats with three or four exclamation marks. If the DPP can move the needle enough to put some of the districts with two question marks into play, they can certainly win a majority. If they can replicate the 2014 result, they will easily win a majority. In fact, they don’t have to do quite that well. The DPP won 50 of the 73 districts (assuming the KMT keeps 7 of the 8 Taipei seats). If you give the KMT all six of the aboriginal seats and split the party list seats 17-17, that produces a 67- 46 DPP majority. Again, I don’t expect the 2016 elections to replicate the 2014 results, but 2014 should be a clear message that the legislative majority is up for grabs. In a recent post, I pointed out that the DPP received an unprecedentedly high vote share in the 30 predominantly Aboriginal townships. This seems to be evidence that preferences are changing among Aboriginal voters. Even if those votes reflect opposition to the KMT rather than support for the DPP, at least the DPP party label is no longer the ballot box poison that it seemed to be in the past. In a comment on another post, Joseph Wang offered an alternative hypothesis. Maybe large numbers of Han people are moving into these traditionally Aboriginal townships. The DPP’s higher popularity among the increasingly populous Han residents might be what is driving the overall rise in DPP vote share. This seemed quite a reasonable suggestion to me, so I thought I’d look into it. There is no way to tell Aboriginal and Han voters apart in the executive elections I looked at in the previous post. However, in legislative elections Aborigines have separate districts, so we can count how many Han and how many Aboriginal voters there are in each township. I looked at the 30 townships with a predominance of “mountain Aborigines” (roughly speaking, all tribes except Amis). This time, I also looked at 5 townships in which at least half of the population was “plains Aborigines” (ie: Amis). It doesn’t seem to be the case that Han migration is driving the trends. The Aboriginal townships have a higher overall percentage of Aboriginal voters in 2012 than they did in 1992. It’s also not the case that individual townships. The biggest drop was in Lanyu 蘭嶼 (8.0%), followed by Namaxia 那瑪夏 (4.1%), Wulai 烏來 (3.8%), Chenggong 成功 (0.5%), and Wutai 霧臺 (0.1%). The other 30 townships all saw the percentage of Aboriginal voters increase. 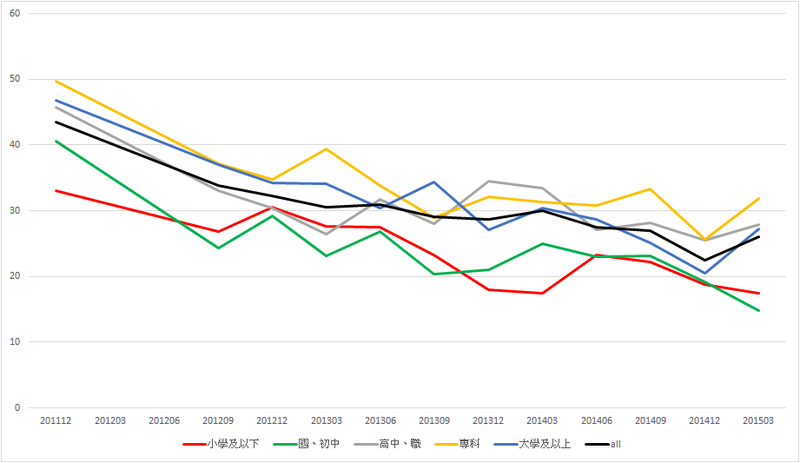 If the number of Han voters is not increasing, it is certainly possible that their political preferences have changed over the past 20 years (just as in the rest of Taiwan). I have heard one story about Han people in Aboriginal townships countless times over the years. Many (most?) of them are Mainlanders, retired soldiers who married an Aboriginal woman and moved into the Aboriginal community. I don’t know how much truth there is to this stereotype. At any rate, it is possible that the Han population in Aboriginal townships has evolved, either in its demographic composition or simply in its political preferences. The DPP has clearly made inroads among Han voters in Aboriginal townships. In the 30 mountain townships, the DPP’s vote share was about 10% higher in 2012 than twenty years earlier. However, remember that only about a quarter of the electorate in those areas was Han. That implies that, if there was no change among Aboriginal voters, the DPP vote share in executive elections should have gone up by only about 2-3% of the past 20 years. The DPP’s increases prior to this year were modest, but they seemed to be more on the order of 5% or so. Han voting might be one part of the changes, but there had to be some changes in Aboriginal voting behavior as well. All this says very little about the DPP’s huge spike in 2014. That change is so large and so sudden that it simply cannot be explained by changes among Han voters. Aboriginal voters had to have changed as well. The CEC has released top-level turnout numbers for the recent elections. They have not yet put the full file online, so we cannot see the sub-district breakdowns. Still, a lot of people have been wondering if turnout drove the unexpected election results. There are some interesting numbers here. Remember, some places always have lower turnout than others. It is harder for people who live in Taipei to return to Hualien to vote than it is to get to Hsinchu. Also, it matters whether people generally expected the race to be close or not. In this table, I’m listing the turnout for each city and county this year. I also put the 2012 presidential election turnout to indicate whether turnout is naturally lower in a particular place. Finally, I give my subjective opinion of how close the race was expected to be. Kinmen 45.2 46.7 -1.5 ? Lienchiang 67.1 65.8 1.3 ? This looks very interesting. If the surprises were a results of lots of blue voters staying at home, turnout should be markedly depressed in those surprising areas. The most surprising places were New Taipei, Taoyuan, and Hsinchu City, and those three all had double digit drops in turnout. The other places with high drops (Kaohsiung, Tainan, Keelung, Hsinchu County, and Taipei) were also places where the KMT did particularly poorly. This is very strong evidence in support of the hypothesis that blue voters stayed at home. However, there is another group of districts where the DPP also did better than expected that did not follow this pattern. 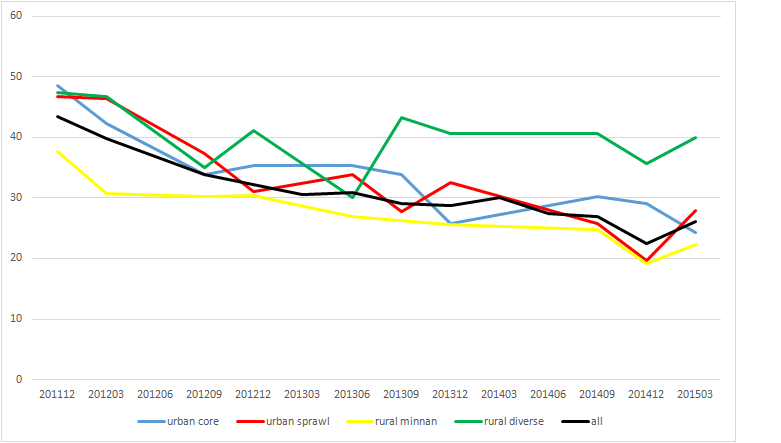 Changhua and Chiayi City saw very small drops from 2012, and Nantou, Yunlin, and Penghu actually went up. The two groups of districts are quite different, and they might be experiencing different phenomena. The larger, more urbanized, mostly northern places might have seen blue voters stay at home, while the more rural, southern places might have seen intense mobilization of potential green voters or widespread conversion of former blue voters to the green side. Remember, this is all speculation. Many of the big drops also occurred in places that were not expected to be competitive, and that might be the critical factor. If it was, then presumably equal numbers of blue and green supporters stayed at home and turnout did not decisively affect the results. The numbers look important, but without more evidence we shouldn’t jump to firm conclusions. So what the hell happened in Taoyuan? I didn’t expect John Wu 吳志揚 to lose, and no one I have talked to saw it coming either. 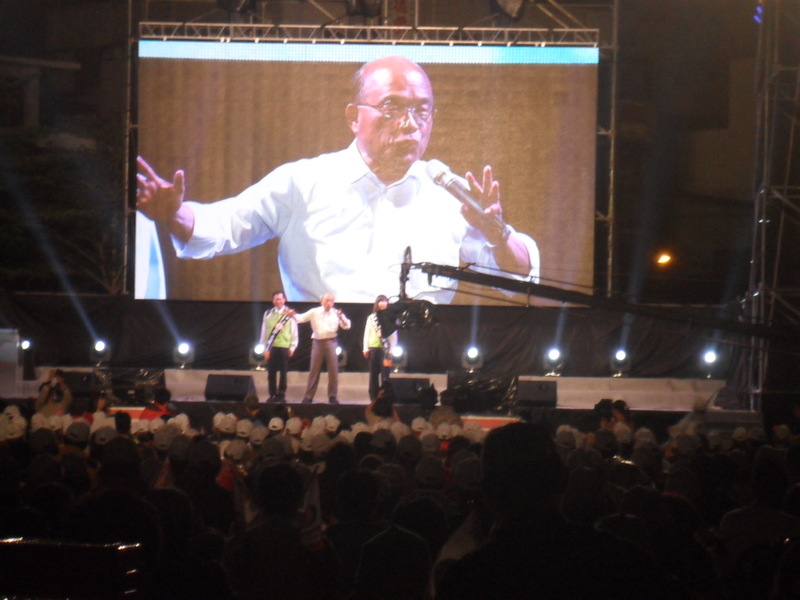 I went to Cheng Wen-tsan’s 鄭文燦 rally on two nights before the election, and I don’t think anyone there expected it either. It was a rather small event. They had extra seats and a big grassy area with an extra screen just in case more people showed up, but they didn’t even fill the main seating area. I guessed that about 4000-5000 people were there. The atmosphere wasn’t exactly electric. The true believers were there fighting the good fight, but knowing in their hearts that the real battle would have to wait until 2016. 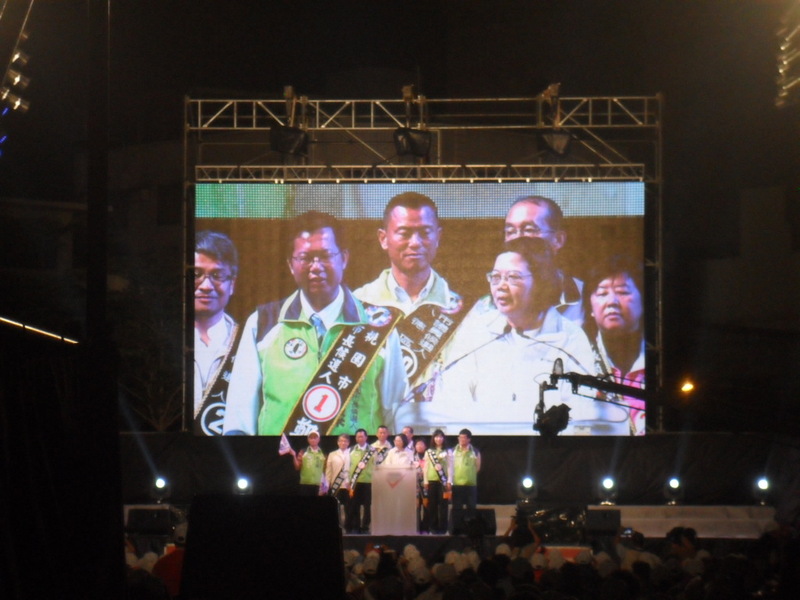 When Tsai Ing-wen told the crowd that Cheng would win and asked them (as they do at every rally for every hopeless candidate), “Do you have confidence?” The answer “Yes!” was decidedly halfhearted. Here, the Light Bulb makes a point. He is really a master on the stump. Maybe this is when Tsai asked the crowd who would win. Lots of empty spaces where there were supposed to be more people. Then on Saturday night, we all watched in disbelief as Cheng took an early lead in the counting. A half an hour later, it dawned on me that we were no longer merely looking at a few strange early reporting ballot boxes, and it was possible that Cheng might win. When the DPP finally lost its lead in New Taipei but Cheng expanded his lead in Taoyuan, my brain nearly went into shock. Rationally, I could see what was happening and tell you that Cheng was going to win, but that simply didn’t make any sense to me. Let me start by saying that we probably won’t ever be able to decipher exactly what happened because we don’t have data. Taiwan doesn’t allow exit polls, so we will never precisely know the demographics of voters who turned out or stayed at home. The main academic post-election survey won’t cover Taoyuan. Due to budgetary constraints, we simply can’t do a survey in every jurisdiction for local elections. 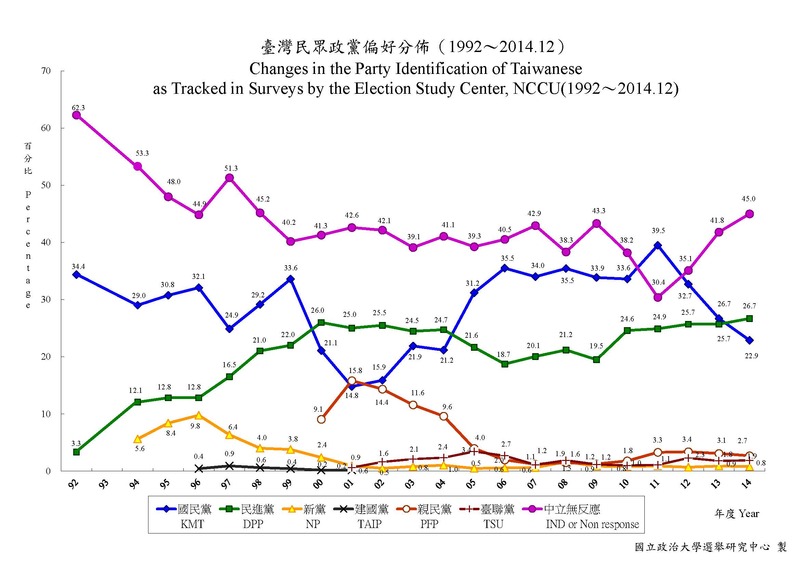 This year, the Taiwan Election and Democratization Survey (TEDS) will study Taipei, Taichung, and Kaohsiung. A week ago, those seemed like a fairly obvious choices. (They are also the ones studied in the last election round, and if you want to look at continuity you can’t change places every cycle.) There will, of course, be telephone surveys, but you can ask far more questions (and far more complicated questions) in face-to-face surveys. Moreover, post-election surveys have the same limitations that pre-election surveys had. If we weren’t reaching the people who made up this anti-KMT wave before the election, how can we be confident we are reaching them after the election? At any rate, the point is that this election result will probably always be something of a mystery. Still, maybe we can find something in the patterns of votes. My first reaction was that this result had something to do with ethnic politics. Taoyuan is often divided into a Min-nan north and a Hakka south. A few decades ago, there was some discussion about whether the county should be split into two new counties. That never happened, but the KMT incorporated the ethnic divide into its unofficial rules. The county magistrate always rotated between Min-nan and Hakka. In Legislative Yuan and Provincial Assembly nominations, the KMT was always careful to nominate the appropriate number of Hakka and Min-nan candidates. Those candidates were then expected to campaign in their half of the county, so that Min-nan candidates got almost all of their votes in the north and Hakka candidates were concentrated in the south. The traditional Min-Ke divide was further complicated by the Mainlander population. Taoyuan is also home to an enormous military presence. Unlike Taipei’s Mainlander population, which was much more diverse (in terms of social status, education, occupation, and income) and was spread out into the regular society, Taoyuan’s Mainlander population was much more concentrated in military villages. The townships with the largest military populations were Bade (north), Longtan (south), Zhongli (south), and Pingzheng (south). In the last two decades, the military has razed almost all of the old military villages. Some of the previous residents are housed in newer military-built buildings, but many have moved out into normal society. The residents of the newer buildings are also not exclusively military families. The units can be bought and sold, so regular people can also move in. As a result, the old segregation of military families from regular society is no longer so prevalent. Still, Taoyuan County – especially the four aforementioned townships – continues to have a disproportionate number of Mainlanders. Further muddying the picture is that Taoyuan has experienced tremendous population growth over the past three decades. This has diluted the traditional ethnic residence patterns quite a bit. It also continually brings in new voters who are outside the traditional mobilization networks. Still, this race featured a Min-nan candidate (Cheng) against a Hakka candidate (Wu), so you would expect to see Cheng doing particularly well in the north. In fact, Cheng beat Wu by a margin of 54.6 – 47.2 in the seven northern townships, while Wu beat Cheng 51.7 – 44.4 in the six southern townships. Aha! It’s an ethnic war! Not so fast. For one thing, the same pattern held five years ago, when Wu barely Cheng in the north (49.7-48.7) but swamped him in the south (54.9-42.6). Cheng went up everywhere, not just in the north. Moreover, the north-south gap is baked into the party system. The DPP always does better in the north than in the south. For, example in 2012, Tsai Ing-wen got 41.6 in the north, but only 37.4 in the south. 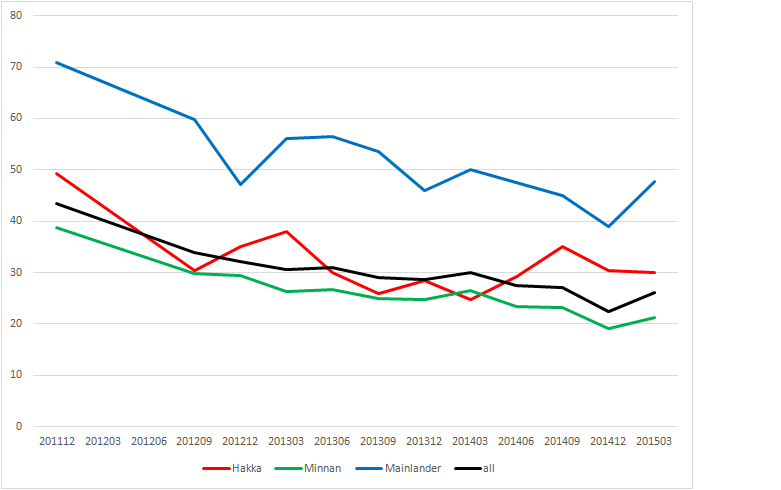 The gap was a bit wider in this election, but there isn’t much evidence for the idea that Cheng won with an unprecedented mobilization of Min-nan voters. A second idea is that turnout was decisive. Lots of people are comparing the raw numbers of votes with previous elections an claiming that they can see evidence that blue voters stayed home, new voters turned out in droves, or something else. I’ve stared at the data for a few hours today, and I just don’t see it. The CEC hasn’t released the full file of official turnout data yet. I can approximate the turnout at township levels by looking at the number of eligible voters (which they published a few weeks ago) and adding up the number of valid votes for each candidate. This is only an approximation, since it does not include invalid votes. In this case, it also might be fruitful to look at neighborhood-level data, but that would take a lot of time and we don’t have that data yet anyway. One idea is that hard-core deep blue voters were disgusted with Ma’s performance and simply stayed at home. The overall (estimated) turnout in Taoyuan was rather low, at 61.5%, so many people did not vote. However, it was even lower in 2009 (53.7) when the KMT won. Looking at the township level, if the deep blue voters didn’t turn out, the effect should be biggest in the places the KMT is strongest. Alternatively, it could be the opposite. Perhaps only the deeply committed KMT voters turned out, and the less committed stayed at home. (Ignore Fuxing. It is an aboriginal township, and the patterns may be completely different. It also is tiny, so it can’t be driving the overall patterns.) Cheng is weakest in Zhongli, Pingzhen, Yangmei, and Longtan. 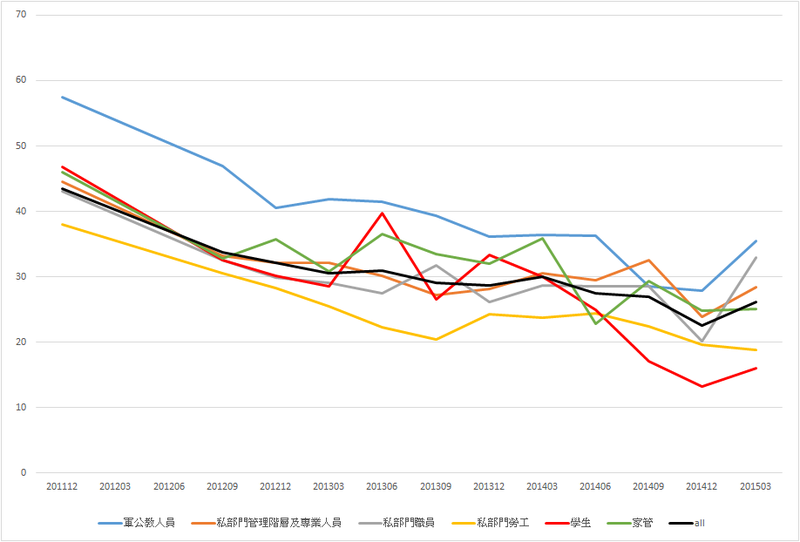 However, the turnout increase is just about at the overall average in three of these, and it is a bit higher in Pingzhen. Cheng’s support increased a bit more than average in three of them, but in increase quite a bit below average in the other (more on that later). There doesn’t seem to be support for this hypothesis (or its opposite). The Mainlander/military presence also doesn’t seem to be driving things either. Three of the four military townships overlap with the strong KMT townships. Trading Bade for Yangmei doesn’t produce any clear patterns. Maybe someone with sharper eyes than mine can find something in the turnout numbers, but I just don’t see anything. This is not a surprise to me. In the days before every election, pundits scream that turnout will be decisive. They make amazingly precise predictions. If turnout drops below 65%, the DPP will win for sure. If it is over 68%, the KMT will definitely win. Or maybe it’s the other way around. Everyone has a guess about how turnout will affect the race, but they often have very different stories and come up with very different conclusions. The problem is that all these stories require heroic assumptions about what kind of people are ambivalent about voting, and there is no evidence for these assumptions. Many of them are based on nothing more than wishful thinking. After two decades of staring at data, I have never been able to find any consistent effect of turnout. I do see one interesting pattern in the election results. Comparing Cheng’s vote share in 2009 and 2014, the two southern coastal townships stand out. Cheng actually got more votes in these two townships in 2009 than in 2014. Moreover, the next smallest increases are in neighboring Dayuan and Yangmei townships. Something about Xinwu and Guanyin townships is different, and that may be the key to understanding what happened in Taoyuan this year. Two possibilities come to mind. First, the coastal areas are traditionally the DPP’s strongest areas. Second, the southern coast is the least industrialized part of Taoyuan. In my previous post, I pointed out that the national wave was larger in northern and central Taiwan and smaller in the rural parts of southern Taiwan. Here we are seeing the same thing. Just to corroborate this point, the next smallest increase is in Daxi, which is another corner of Taoyuan relatively less affected by industrialization and fast population growth and which traditionally is one of the DPP’s better areas. The biggest increases are in Taoyuan and Guishan townships, where much of the recent population boom has been centered. It is going far beyond the data to speculate why we are seeing this pattern. It could be anger over food safety, which might be a non-partisan middle class issue. It might be something about urban class conflict. It might have something to do with the Sunflowers. However, I’m becoming more and more certain that the answer has to have something to do with city life. This election keeps surprising me. Looking through the results today with a few Aboriginal friends, we stumbled on another “Holy crap, dude!” finding. As everyone knows, the DPP has never done well among Aboriginal voters, to put it kindly. In recent years, the DPP has slowly started to make small inroads into this demographic. Usually you can draw a direct connection to growth in the DPP’s vote share and control of a national or local government. Since the DPP doesn’t control the national government and only controlled a few local governments (all of which they had already controlled for significant periods of time and thus had presumably already picked all the low hanging fruits), this election cycle didn’t seem too promising. One consistent trend is that the DPP has always done better in local mayoral/magistrate elections than in national presidential/gubernatorial elections. I looked at the DPP vote share in 30 primarily Aboriginal townships around Taiwan. This is by no means a perfect measure of Aboriginal voting patterns. For one thing, it almost completely ignores Amis voters, who generally live in townships with majority Han populations. If you have extremely good local knowledge, you can separate the Amis villages from the Han villages, but that is beyond my knowledge and would take a lot of time. This also ignores the Aborigines who live in urban areas. 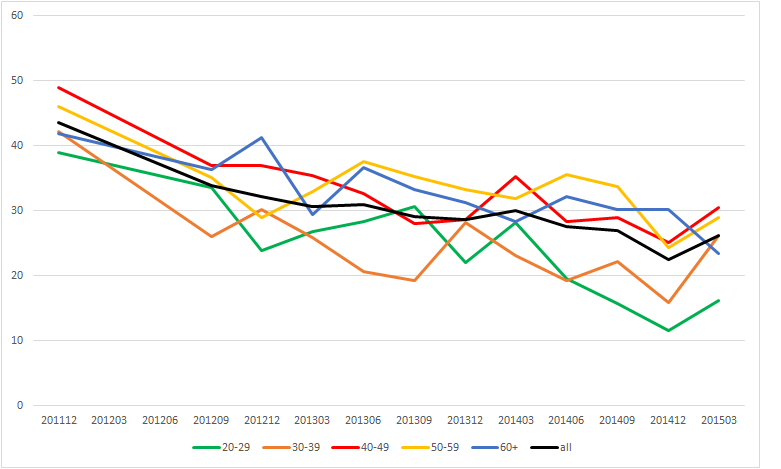 Nonetheless, this may provide important evidence of the actual underlying trend. Here are the aggregate DPP vote shares in the 30 Aboriginal townships for local and national elections over the past two decades. This is an enormous leap into uncharted territory for the DPP. Moreover, this is the first major increase where I can’t point to DPP control of a national or local government. I can’t say with any confidence what is happening. The obvious guess is that Aborigines, like the rest of the Taiwanese population, are fed up with the Ma government, and many previous supporters have voted for the DPP in protest. It will be interesting to see if the DPP can hold this support in the future. Regardless, it is jarring to see the DPP win over a third of the votes in Aboriginal townships. As we wake up this morning, we are still trying to figure out where the hell that tidal wave that blindsided us last night came from. The polls gave us fair warning about some of the races. The Taipei result was clearly within the realm of possibility. I actually scribbled down a few back-of-the-envelope numbers a few days ago for Sean Lien’s vote share and came up with 41%. Of course, I didn’t believe that and I actually put down 44.5% for our office prediction pool, but the point is that you could have seen that result from the polling data. Similarly, Keelung City wasn’t a big surprise, and I wasn’t shocked that the DPP easily won in Yunlin or that the Nantou race ended up being pretty close. Some of the other results, though, simply came out of the blue. In particular, Taoyuan and Hsinchu City were complete shocks. I hadn’t seen any hints that those races might even be competitive. Taichung City, Changhua, Chiayi City, and New Taipei City were surprising to me, though not as unfathomable as Taoyuan and Hsinchu City. In general, the pre-election polls simply didn’t prepare us for yesterday’s results. So what did the polls completely miss? The simplest answer is that many undecided voters made up their mind at the last minute to vote against the KMT. I have serious doubts about this, but there is no way to test this hypothesis with the data available right now. The KMT should hope that this was simply lots of last-minute decisions, since that would imply that the wave against the KMT was rooted in very shallow disapproval and could easily be reversed by 2016. I suspect what may have happened is the emergence of the new economic cleavage as a powerful electoral force. I see two big groups of people who might have been vastly underrepresented in the surveys: younger people who have completely cut their landline connections and lower-wage labor who rent apartments in one district but vote in another. We have good reasons to believe that both of these groups are especially dissatisfied with the current government, so it is plausible that they were the bulk of the surprise wave. Of course, this will need a lot of testing before it is anything more than mere speculation. Let’s look at the wave to see a few trends. 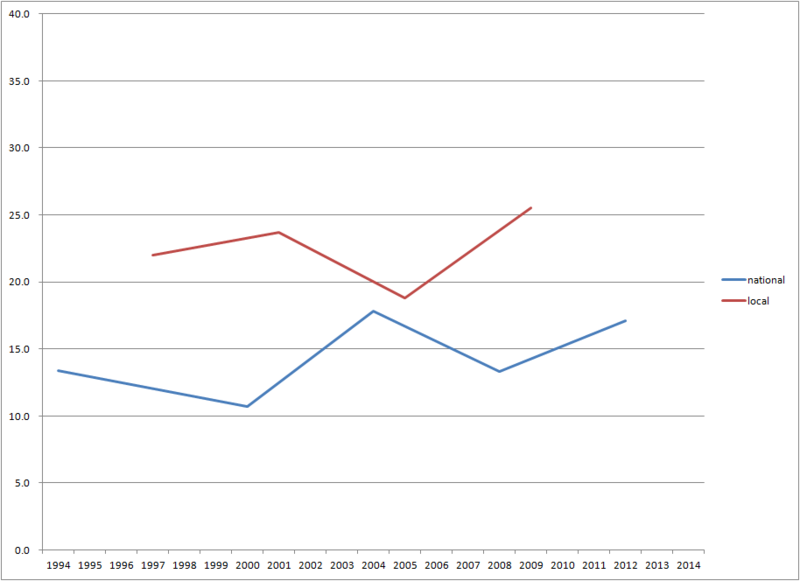 I’m comparing the KMT’s performance in yesterday’s elections to the KMT’s 2012 presidential vote share. I know that comparing presidential votes to mayoral votes is like comparing apples to oranges, so don’t bombard me with complaints about this. The purpose of using the presidential vote as a baseline is precisely to strip away the local factors to see what the partisan balance used to be. The difference between the two elections is a combination of (1) the national wave and (2) the local factors specific to that race. I usually look at things from the DPP’s point of view because that usually provides a clearer picture. In this election, however, I think it is more appropriate to look at things from the KMT side. For one thing, I think that this was almost certainly an anti-KMT wave driven by dissatisfaction with the national government rather than a pro-DPP wave driven by widespread attraction to the DPP and its platform. For another, the KMT only had one serious split (Keelung) while the DPP arguably had three (Changhua, Hsinchu City,and maybe Miaoli). Taipei City is by far the worst, but we expected that. Sean Lien was a special disaster, and the blue coalition broke apart in Taipei in a way that it did not anywhere else. In Tainan and Kaohsiung, extremely popular DPP incumbents were running against weak challengers. Here, the KMT dropped about 13%. In Taichung and Taoyuan, we had KMT incumbents running for re-election. In these two races, the KMT dropped 9%. New Taipei City is the obvious outlier. 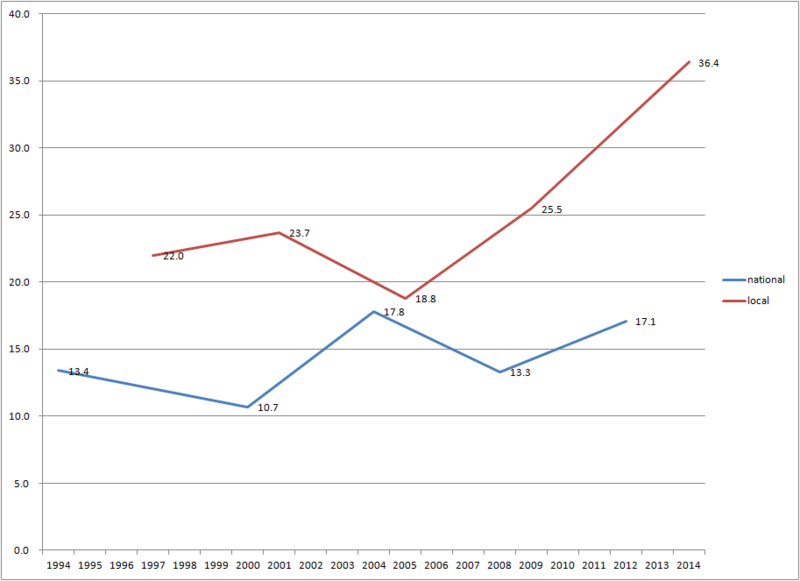 Eric Chu was also a KMT incumbent running for re-election, but the KMT vote in New Taipei dropped less than 4%. It was very surprising to many people (including me) that Chu made such a proud and aggressive victory speech last night. This is why. He can point out that he alone withstood the wave and, due to his personal popularity, held onto almost all of the previous KMT coalition. Even with his surprisingly narrow margin of victory, he is a clear winner in this election. Another interesting facet of this wave is that it was much more powerful in the north than in the south. In the north, there are specific local factors that depressed the KMT’s vote in nearly every race. Still, there was almost certainly a national effect underneath the local effects. The Taoyuan swing of -9% might be a fairly representative effect. In central Taiwan, both Taichung and Changhua also saw roughly 10% swings. However, once you get to southern Taiwan, things look different. Put aside Tainan and Kaohsiung (and their highly popular incumbents seeking re-election), and look at the mostly rural and more heavily agricultural south. The standard swing seems to be only about 5%, or about half that of northern and central Taiwan. I don’t want to cut things too fine here, but the crude pattern of a bigger swing in the north than in the south seems evident to me. (The fact that the KMT is stronger in the north and therefore has more votes to lose doesn’t account for the difference. If you divide the swing by the KMT’s 2012 vote share, the swing is still larger in the north than in the south. As I write, the broad outlines of this election are coming into focus. At first glance, this is a tremendous loss for the KMT. The DPP is winning all the races that were supposed to be close by large margins, and the KMT is barely eking out victories in areas that it was supposed to win handily. It looks as if Eric Chu will barely survive, but John Wu will suffer an unthinkable upset loss in Taoyuan. The KMT will barely break 50% in Miaoli, and they might even lose Hsinchu City. Even without candidates in Taipei City, Hsinchu County, and Hualien County, the DPP might get more votes nationally than the KMT. This is simply stunning. We are seeing a national wave of voters withdrawing previous support from the KMT. There are individual stories in each race, but the national trend is clearly against the KMT. What’s more, this is a trend that did not show up in pre-election polls. (Indeed, there was a huge mess of rumors claiming that various unpublished polls had showed the KMT closing the gap in Taichung City.) The easiest inference is that the wave of young voters came out overwhelmingly against the KMT. Young voters often do not reside in the place where they vote, so they might not have been counted in pre-election polls. Many people will attribute the result to Sunflower students going home in droves to vote, and they might be correct. However, this wave is so large that it might be more than that. It seems that people who were undecided broke against the KMT in the last few days. It could be that they were simply silent all along, or it could be that many of them made similar decisions in the last few days. What is clear is that my earlier insistence that Sean Lien’s problems were all personal was missing a big part of the picture. I suggested that if the KMT lost Taoyuan, that would be a good indicator that something deeper was happening in Taiwan. Well, something deeper has happened. You are currently browsing the archives for the 2014 mayor category.